Stellar Clusters are groups of stars that fall into two broad categories: Open Clusters or Globular Clusters. Both types of cluster are formed from gas clouds and dust coalescing into a multitude of stars, but this is where the commonality ends. Open Clusters can contain up to a thousand stars which are normally very young, in cosmic terms. They are generally found in the stellar nurseries of the spiral arms of the galaxy. As the Open Clusters contain young stars they are often hot stars, blue to white in color. Some Open Clusters appear to to the eye as just a collection of disassociated stars. A typical example of this would be the Beehive Cluster, M44, in Cancer. This is an example of an older Open Cluster where the gasses and dust have either been ejected or incorporated into the cluster members. These may even have some older orange stars in the group and be very spread apart like the Hyades in Taurus. I spent ages when I first started in astronomy looking for the Hyades Cluster, not realising how big it was and how far apart its members were. Middle-aged Open Clusters such as the Pleiades or M45 have bright blue stars of spectral type B. Although the Pleiades stars are surrounded by blue nebulosity this is reflection nebulosity in interstellar matter rather than the gaseous remains of the stellar nursery. 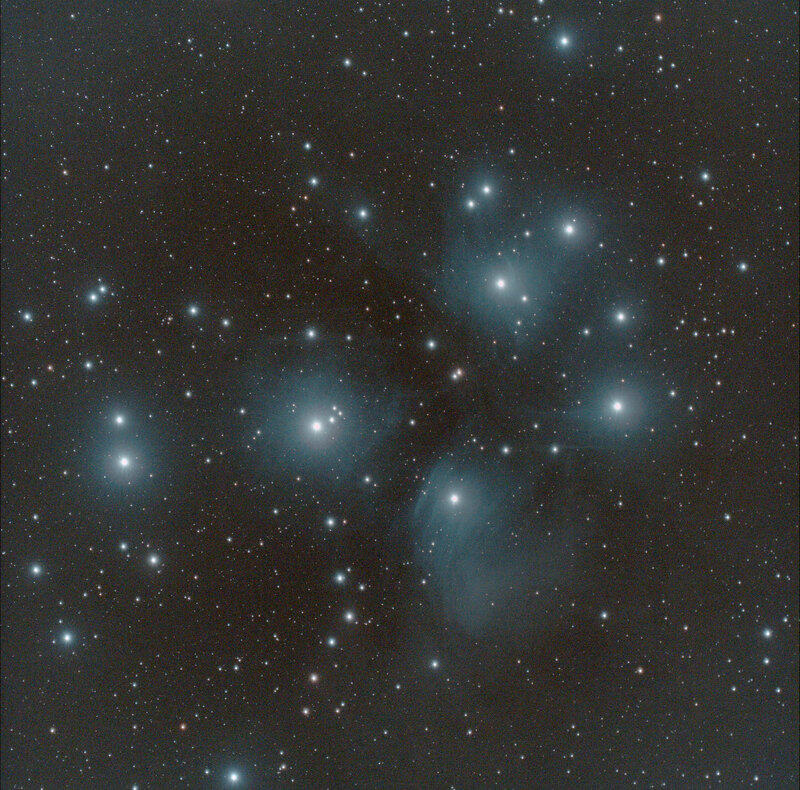 The Pleiades are a very visible cluster to the naked eye, even from areas with heavy light pollution. They form a question mark in the winter skies of the northern hemisphere. Young Open Clusters can be found within the heart of the star generating nebulae, such as the Heart Nebula (IC1805) , and the Orion Nebula (M45). These are surrounded by gasses and stellar dust. The gas is predominantly hydrogen giving these nebulae the characteristic red color. The Heart Nebula actually has a number of Open Clusters associated with it, the main one having the same name as the entire nebula. This is found in the Heart of the Heart at the top of a pillar of gas. 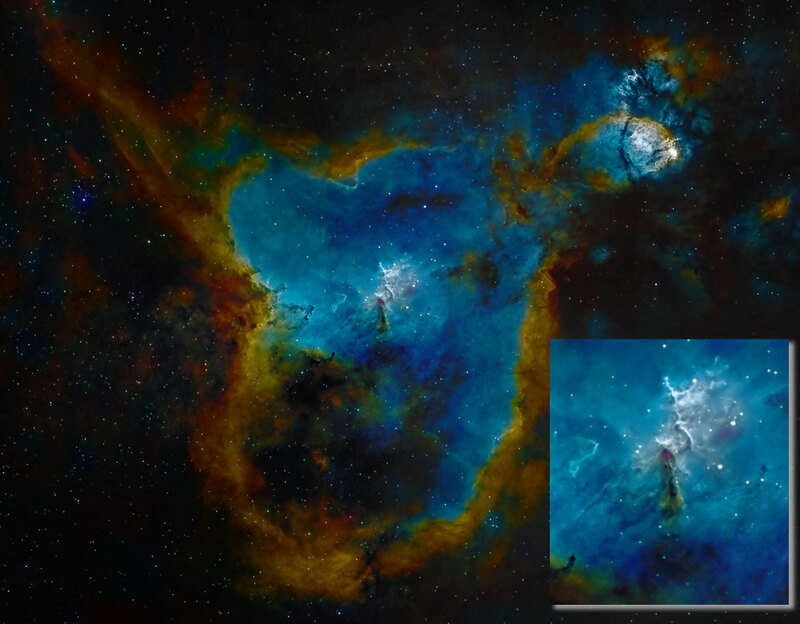 The dramatic coloring of the heart nebula image is because the data was captured using narrowband filters and creating a false color final result. 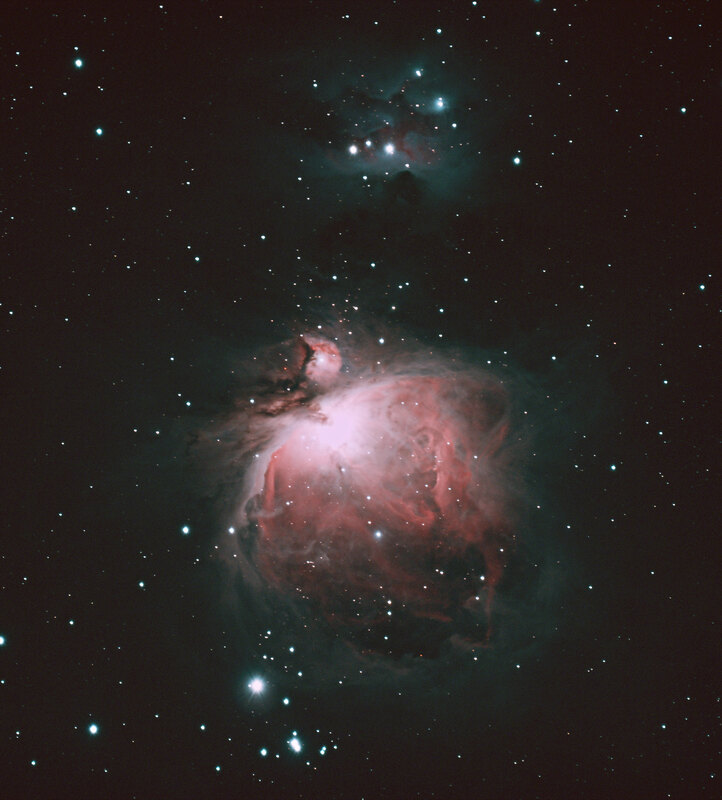 Within the center of the Orion Nebula, M42, is an area known as the Trapezium Cluster. The Trapezium Cluster contains just a few stars, but they are very bright and very hot. They shine through the nebula and can be easily seen in a small telescope. Globular Clusters are categorised by the number of stars in the group ranging from a few thousand to many millions of individual stars. These are all congregated in a relatively small area and are bound together by gravity. Most Globular Clusters exist outside the main ecliptic of the galaxy in the halo of the galaxy and orbit the galactic core. In contrast to the Open Clusters the Globular Clusters are formed from very old stars and will typically be seen ranging from white to orange in color. The predominant star type in a Globular cluster is spectral type G which is the same as our Sun. There can still be some younger stars in the cluster, but images will mainly show white and orange stars. There are around 150 Globular Clusters orbiting our galaxy. The precise number of the Globular Clusters is difficult to ascertain as they are not all visible so the quantity has been estimated based on the number of observable clusters. Globular Clusters are not unique to our galaxy, we can observe similar star clusters orbiting other galaxies. 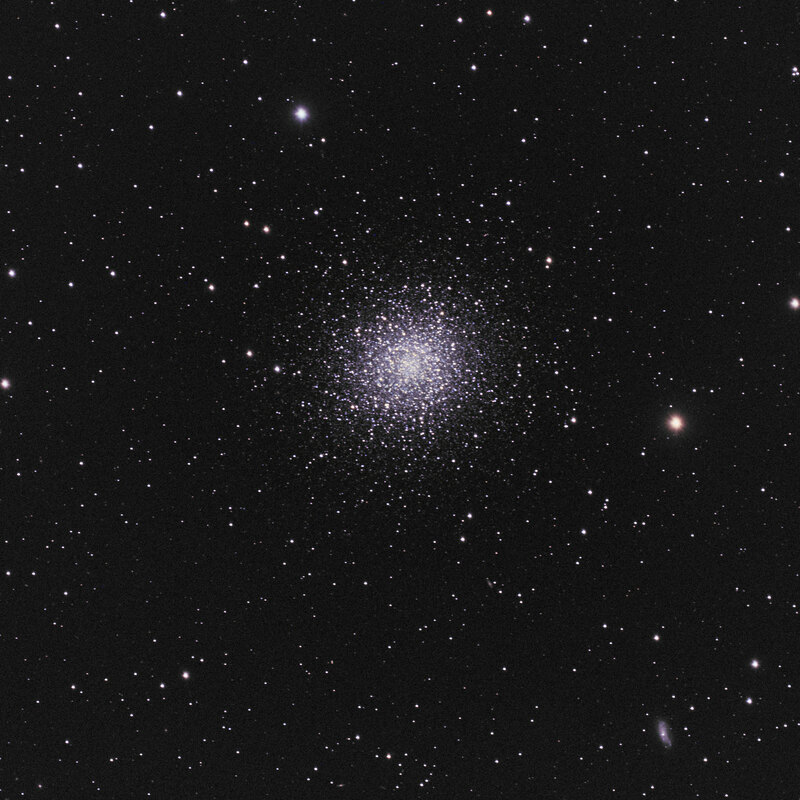 The best examples of Globular Clusters are M13: The Great Globular Cluster in Hercules, and Omega Centauri in Centaurus. Both of these can be seen in dark skies without a telescope. M13 is a classic northern hemisphere object visible throughout summer and autumn. Omega Centauri is visible from more southerly sites, and in the southern hemisphere. To the naked eye the clusters will appear like a faint fuzzy blob, not dissimilar from a galaxy. When viewed with binoculars the circular form can be observed, without a distinct edge. Telescopes reveal more of the structure of the cluster, including some of the individual stars in the core extending out to the diffuse stars of the extremities. As with all astronomical observations of faint objects the real detail and beauty of these clusters is revealed in astrophotography. Using the technique of combining a number of long exposures and careful processing the structure and form of the cluster can be teased out. Good luck hunting for these star clusters, the best ones to look for in the summer are M13 in the Northern Hemisphere and Omega Centauri in the Southern Hemisphere.